We walk our Nemesis…the dreaded Sawtooth. In other words, we’re wimps. When we walked the South Island we were often accompanied by a woman called Anna McNuff. She was running the length of the country carrying a 15kg back and enough enthusiasm to power a small Southland town. As she ran she would duck into local schools and tell groups of enthralled kids about her life out in the hills. Part of her talk involved getting out a hideous pair of printed tights that from memory featured a rainbow unicorn battling a robot dinosaur. I can’t remember what she called them but we call them ‘Anna Pants’. The gist of her talk was about leaving your comfort zone and really experiencing life. Her special pants made her feel brave. We woke early at Howlett’s Hut, had our last meal then put on our metaphorical Anna Pants. We were about to leave our comfort zone. Handily we’d also brought along our own astronaut undies just to make sure. The weather was perfect. Blue sky and only a breath of wind was exactly what we’d hoped for. The predicted 5 metres per second winds had thankfully stayed at home for the day. As we walked up to the start of Sawtooth Fiona asked me to apologize for what was about to happen. Apparently it had been my idea. From the road Sawtooth looks…like a long saw. From Tiraha, the mountain overlooking it, it looks a bit daunting. Before we left I refilled our bottles from a tarn. Once we were on it we quickly knew that we were both out of our comfort zones. We were faced with a seemingly endless run of peaks, some climbable, and some not. The path up or around them often led to a dead end that came with either a steep climb or steep dropoff. I’ve included a lot of photos with this story…yes they all look the same…but that’s what it was like. Peak after peak. Climb after climb. I get vertigo. Fiona did too that day. I thought we might high-five when we finished. I contemplated texting a friend who’s husband had tried and failed to take Sawtooth due to weather a couple of times. But we just sat and ate a sedate lunch on Ohuinga while looking at maps. The day had only just started. I think Fiona said there would be six 300 metre climbs with often similar conditions between them. As we passed from one to another it never felt like we were coming close to an end. 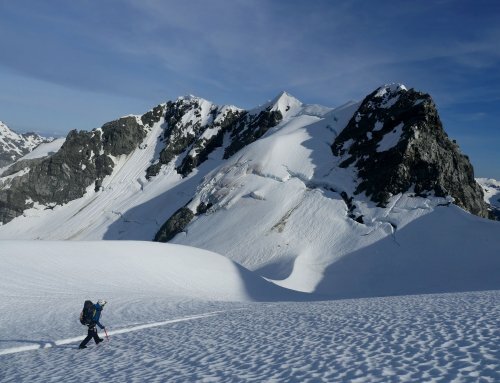 On the map Paemutu, on the ominously named Broken Ridge, looks just like any other mountain. A small black dot. When the cloud parted and we saw the mountain and the jagged route to it I actually went weak at the knees. Fiona stopped looking left or right and prayed to the God of Tiny Trails as she followed one worn groove after another across the closest thing to terrifying we’ve ever experienced. After we slid off Paemutu, another 300 metre grunt to A6G4 just about finished us off. We were exhausted, it was almost 5.30pm and our hut was looking a very long way away. But one more ridiculous knob later and we felt we were over the worst of it. At 6.00pm we stopped on the top of Rangioteatua to decide where we would spend the night. We could see two routes to Waikamaka Hut. One, down Rangi Saddle looked dark and difficult, the other to Waipawa Forks Hut stretched before us along a golden tussock covered Ridge. The spur down to Waipawa Forks was lit by the setting sun. The choice and the going was easy. As we dropped off the saddle into the valley down to the hut darkness fell. At 7.30pm we turned on our torches and at 9.00pm we got to the hut. We had tuna on crackers and took a couple of painkillers before taking off our Anna pants, our soiled astronaut undies and climbing into our sleeping bags.